Economic downturn and plunging peso shaved $25 billion from the fortune of Latin America's richest man. Global recession testing his ability to live up to the principles he sets for his employees: "Maintain austerity in times of fat cows." 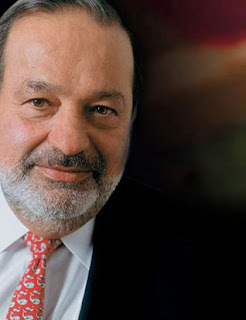 Son of a Lebanese immigrant bought fixed-line operator Telefonos de Mexico (Telmex) in 1990; now controls 90% of Mexico's telephone landlines. Would be a billionaire based on his dividends alone. Biggest holding: $16 billion stake in America Movil, Latin America's largest mobile phone company, with 173 million customers. America Movil and Telmex reportedly planning to jointly invest $4 billion to bolster telecom infrastructure in Latin America. Buying up cheap media, energy and retail assets. Last year took stakes in New York Times Co., former billionaire Anthony O'Reilly's Independent News & Media and Bronco Drilling; also increased position in Saks. Baseball statistics aficionado, art collector.